I suddenly realized that I’ve only managed to finish one quilt this year – my Siblings Together quilt. I can’t remember when I last had so little to show for a year….quite a few bee blocks, one small, quick quilt and a plain vanilla jumper…..
Part of the problem I think is that the projects I get involved in are, well, all ….big. 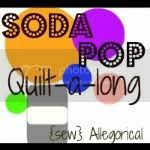 I’m not a quick project person, never have been….so although I’ve been sewing on my projects – the leaves quilt and the fireworks quilt – pretty regularly, neither of them is anywhere near being finished. I guess that’s the downside of working and not having a lot of time to sew….my things are going to take forever and a day to get done. I will finish them, I always do, but it ain’t gonna happen in a hurry. 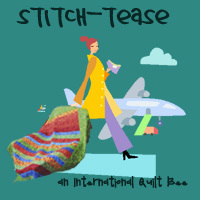 Not to mention my lovely Stitch Tease quilt top from last year. I’m feeling a bit guilty on that one as in the last few months a lot of finished tops have been popping up all over the web – and very beautiful they are too – mine is still sitting in it’s box waiting for a border. At least I’ve got as far as buying the fabric I need to make the border, even if I haven’t quite made my mind up about what exactly I’m going to do. I did manage to get one of Ange’s blocks for this year’s Stitch Tease done this morning…..
She’s making a quilt made with all different sorts of house blocks – this one is ‘Schoolhouse’ by Soma Acharya of Whims and Fancies. One more to go…the next one has to be purple. This entry was posted on Sunday, November 17th, 2013 at 1:08 pm	and is filed under Quilting. You can follow any responses to this entry through the RSS 2.0 feed. Both comments and pings are currently closed. I love to see your progress, no matter how small. Enjoy your time sewing as you like, there is no race. Working is a big problem! it always eats into the time you want to spend doing other things. I am not working now (caring for ill parents & about to become a Granny) and my sewing & knitting time has increased no end. I absolutely love your house block. I hope you are well. There are no quilt police to come along and make you work faster! Relax and enjoy it at whatever pace you like. Love the hula hoop girl! What is it they say about Life? It’s not the destination but the journey that matters? I’ll go with that as long as you’re enjoying yourself! I’m sure all the bee blocks together make several quilts, look at it that way!